One marvelous fact about our universe is that at the largest scales, it is fractal. Unlike true fractals, which exhibit exact self-similarity, the universe is only statistically self-similar. If you looked at the most massive objects in the universe, a record held by the gargantuan, invisible dark matter blobs holding clusters of galaxies together, which clock in with masses upwards of 10^15 times the mass of the Sun, you’d find that they’re rife with smaller blobs, or “halos” of dark matter. Many of these smaller dark matter halos are inhabited by a galaxy, including giant bright elliptical galaxies, the smaller and fainter spiral galaxies, and hordes of yet smaller, fainter galaxies. Peering closer at, say, one of the dark matter halos of a Milky Way-like spiral galaxy, which clocks in at about 10^12 times the mass of the Sun, you’d find that it in turn is surrounded by a similar but down-sized army of even smaller dark matter halos, which may contain even fainter “dwarf” galaxies. And the halos of each of these dwarf galaxies in turn can host their own army of even tinier dark matter halos. If you just looked at the dark matter of a galaxy cluster, a single spiral galaxy, or a dwarf galaxy, it would be hard to tell which was which—they would roughly look like scaled up (or down) versions of each other. How far down does this fractal structure go? We can search part of the way down by searching for the smallest, faintest galaxies that live within them—which is an incredibly difficult task. To go further down to the smallest dark matter halos, which may be completely dark, and thus unobservable by usual means (i.e. by light), we’ll have to turn to more exotic methods. The faintest dwarf galaxies we’ve found thus far have been discovered by hunting for clusters, or “overdensities,” of stars. This technique can only uncover dwarfs in which we can observe individual stars, which we can distinguish only pitifully far—just to up to about 5 Mpc away, which is a little beyond the edge of the Local Group of neighborly galaxies. What about the faint dwarfs that live even further away, far enough that they appear as fuzzy patches of light, and not as collections of stars? 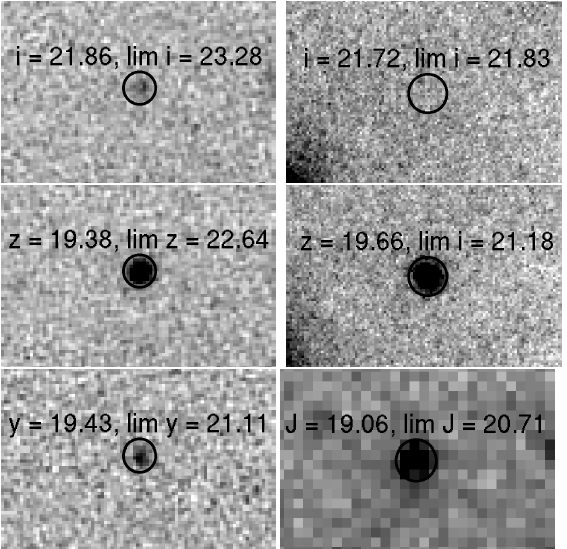 The authors of today’s paper discuss our prospects for finding these “integrated light” images of dwarfs (see Fig. 1) as far away as 10 Mpc. To do this, they set out to ask a simple question: how many galaxies could they find, given a telescope with a particular resolution and sensitivity? Figure 1. 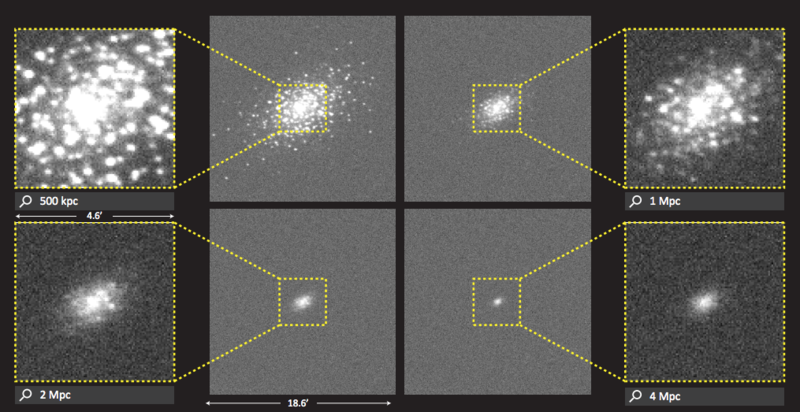 Simulated observations of a faint dwarf galaxy at different distances from the Milky Way. If the dwarf is just outside the Milky Way, at about 500 kpc, we can see the individual stars within the galaxy. However, if such a galaxy is farther away, it becomes increasingly difficult to resolve individual stars. At 4 Mpc, it only appears as a fuzzy blob of light, and we can no longer see the individual stars in the galaxy. Detecting such far away, faint dwarfs requires new search methods. Figure taken from today’s paper. To carry out this calculation, the authors assume—for lack of data—that the faint galaxies as far as 10 Mpc look like the ones we’ve seen that are close by. Based on these nearby galaxies, they estimate how large and faint the far away dwarfs they’re searching for would be, then determine whether or not we could see them. They also estimate the mass in stars each of these far away dwarfs have—a key quantity that allows them to guess the mass of the dark matter halos the dwarfs inhabit. It’s as yet unclear as to how much dark matter a galaxy with a given mass in stars has—a mapping we call the stellar mass-halo mass (SMHM) relation, so the authors adopt two different ones. With the dark matter mass of the dwarf galaxies, it’s simple enough to determine the number of such dwarfs that should exist out to 10 Mpc from simulations of the Milky Way and its surroundings. Figure 2. 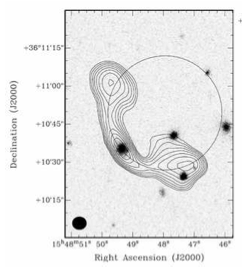 The number of dwarfs between 3-10 Mpc that we could see with a telescope of a given resolution and sensitivity. The angular resolution is shown on the horizontal axis, and the sensitivity, here quantified as the surface brightness μ, is shown on the vertical axis. The colors and black contour lines denote the number of dwarfs you can see per square degree in the sky (an area equivalent to five times the Moon’s). The two panels show results from two different SMHM relations (see above paragraph for details). Brighter dwarf galaxies—those with smaller μ and thus at the bottom of the plots—can be seen no matter the resolution of your telescope. Fainter dwarfs—those with larger μ and higher up on the plot—are found in greater abundance, and we need good spatial resolution (fewer arcsecs) to detect them all. Figure taken from today’s paper. The authors find (see Fig. 2) that—as you might expect—brighter dwarfs can be discovered no matter how good the resolution of your telescope is. However, when attempting to discover fainter dwarfs, the resolution really begins to matter. If say, you had a telescope with a resolution of 9 arcsec versus one that was twice as good, you could detect as much as six times as many of the faintest dwarfs. They also find that the SMHM they assume can affect the number of the faintest dwarfs they expect to find by as much as a factor of five. The authors calculate that using this “integrated light” method to hunt for faint dwarfs using the Dragonfly Telescope Array, a telescope that was designed for the task, we could find a similar number of galaxies—if not more—as surveys that rely on the traditional method of finding clusters of individually resolved stars. This is an exciting result. The few smallest, faintest galaxies we’ve found so far currently puzzle astronomers: How many of them are there? Why are they so faint? How did their stars form? We could begin to unravel these mysteries once we find more of these tiny galaxies.